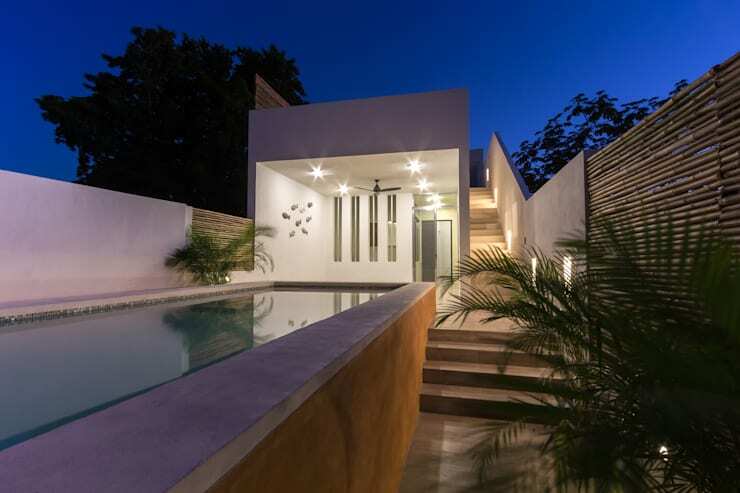 Casa 45 is a neat and minimalist house on the outside, spacious and artistic on the inside. 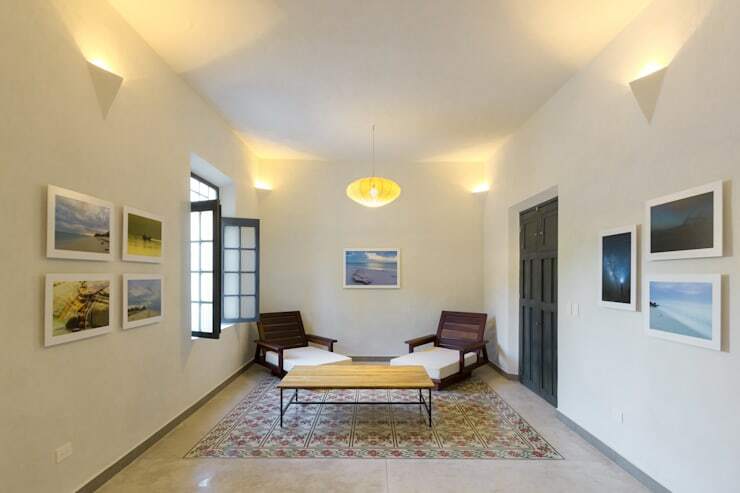 Airy and well-maintained courtyards ensure that the residence stays well-ventilated and sunny, while paintings in almost every corner celebrate the owners' love for art. Sleek designs, modish furniture and soothing lights make this house welcoming and cosy. 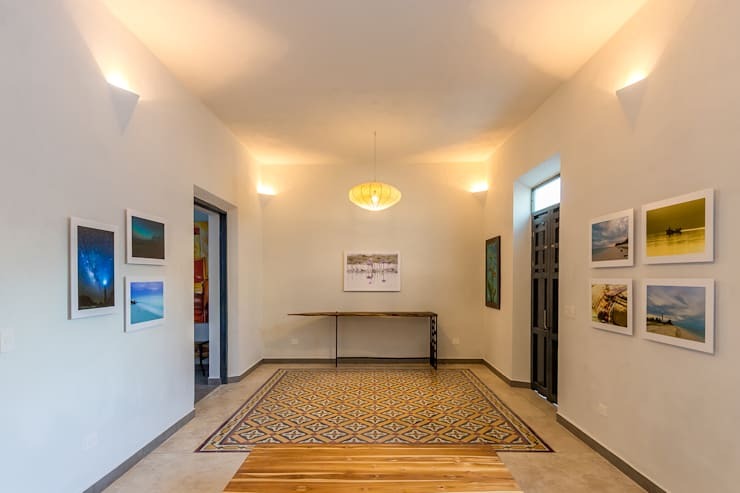 Credit for all this goes to the architects at Cervera Sanchez Arquitectos. The sleek pale grey facade with neat white lines is a pleasure to behold. 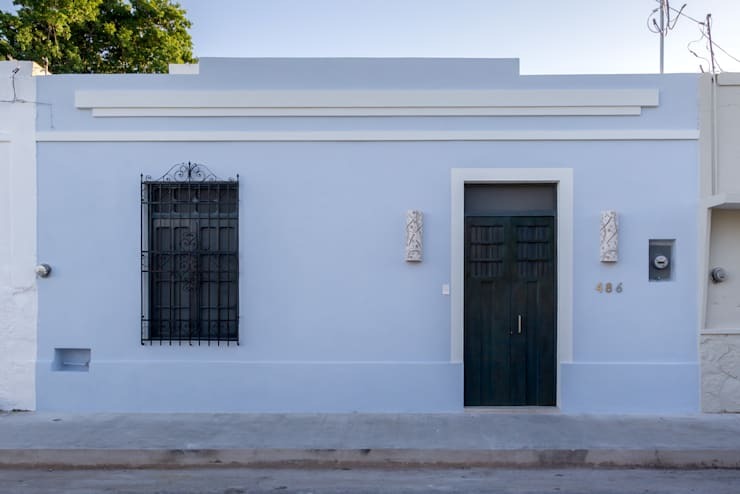 It has a soothing effect on the eye, while the door and window wow with beautifully crafted wrought iron grilles. 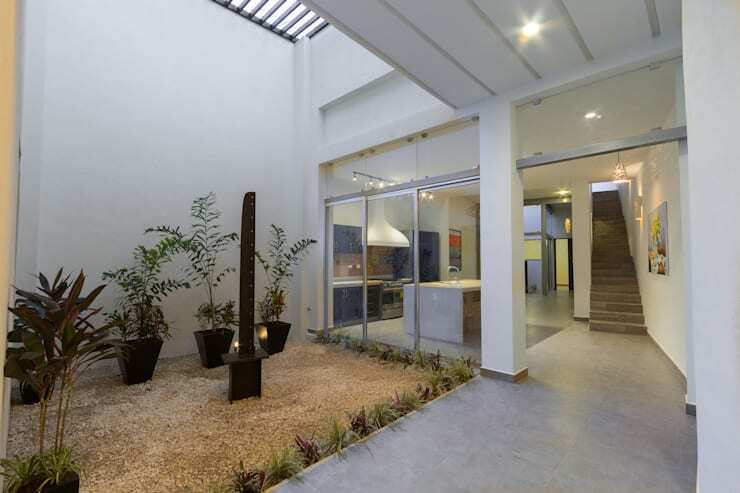 The stylish sconce lights on either side of the entrance are a pretty touch. The longish living room is serene and inviting, with creamy white walls and lovely patterned tiles on the floor. A couple of trendy recliners and a sleek coffee table promise relaxation here, while neatly framed paintings add colour and personality to the room. It’s like walking into an art gallery! Paintings and patterned tiles rule the other side of the living room too. Soothing wall sconces and a pretty pendant light fill the space with enchanting golden glows. Courtyards like this make the house a very refreshing, airy and sunny affair. Neatly manicured grounds and potted greens make this the perfect spot for meditation or relaxation. Sliding glass doors separate the courtyard from the interiors, without hampering visual continuity. Flanked by courtyards on either side, the open kitchen stays fresh and odourless at all times. Sliding glass doors separate it from the courtyards without destroying the expansive and airy feel of the house. 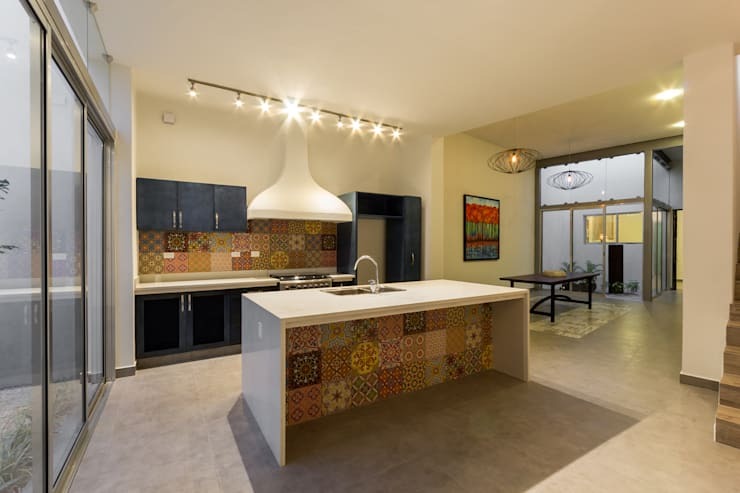 Vibrant ceramic tiles add pizzazz to the kitchen island and backsplash, while bright focused lights make working here a dream. The white chimney looks very stylish and contrasts the dark cabinets nicely. The staircase leading from the kitchen to the rooftop terrace is artfully concealed behind an unusually built wall. 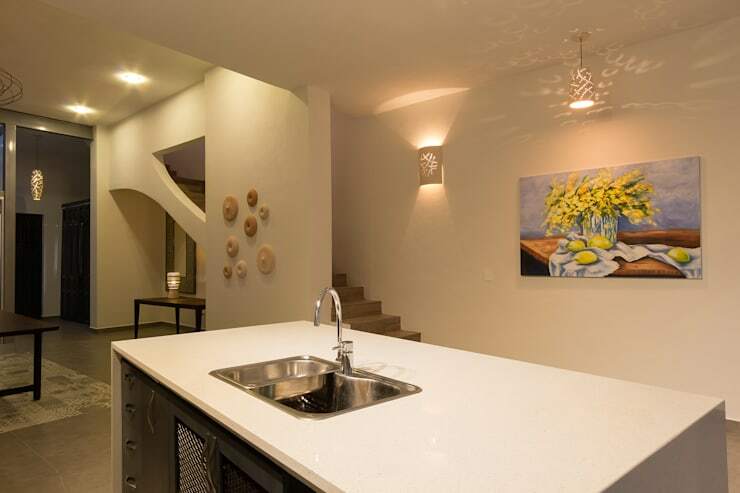 Charming lights brighten up the staircase, while a colourful painting adds life to the wall opposite the kitchen island. 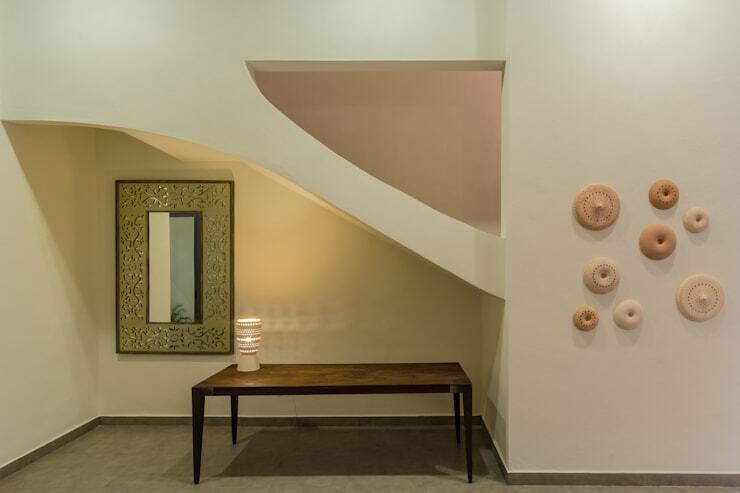 Quirky circular decor pieces add personality to the wall concealing the staircase, while the space underneath the steps has been used smartly too. A mirror with an ornate frame and a sleek wooden table occupy this nook, which can be easily used as a home office or reading corner. A long and sleek pool steals the show in the backyard, while beautiful lights add a warm glow to the space. The staircase on the right leads up to the terrace as well as the garden next to the pool. The boundary wall is a unique combination of concrete and bamboo strips, while verdant palms lend a refreshing touch. Keen to see some more delightful dwellings? The modern stone home built for family life. What do you think of these gorgeous airy interiors?